A wonderful and moving memoir. Following a catastrophic stroke, Jean-Dominique Bauby spent several weeks in a coma, then wakened to a new reality. The 44-year-old sharp, high-living editor of French Elle was now a victim of "locked-in syndrome": he was mentally alert but unable to move or speak. Through sheer determination and a dose of the miraculous, Bauby learns a new way to communicate: by blinking to "speak," selecting one letter at a time, as someone read aloud a new alphabet rearranged in order of the letters' frequency of use. 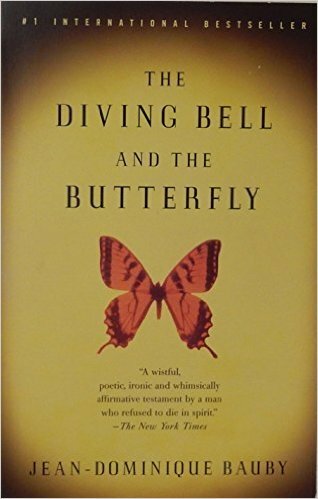 The diving bell of the title is the sheer weight of his useless body, but the butterfly is the human spirit that flies free.